Anybody have any Shimano Zee weights yet? Discussion in 'Downhill & Freeride' started by aenema, Jul 16, 2012. I am specifically wondering about cranks but I am sure we would all be curious about the rest. In the market for a new set and the price is good. I don't consider myself too weight weenie but if there are other reliable models out there for the same price and weigh less, I will get the ones that weigh less. Has anybody put these things on a scale yet. Sicklines doens't and a google search has not come up with anything either. Updated the Zee post on SickLines with the claimed weights for you. Will get some verified weights once i get a hold of the Zee stuff for ya guys. I am assuming the crankset weight includes bb, bb-sleeve, and chainring. How do Zee derailleurs compare to SLX derailleurs? Not sure what you're after exactly but I'd say the Zee deraileur is more in the lines of a cheaper Saint dearilleur without some of the Saint extras than SLX. The Zee comes in a short cage derailleur as well which is a perk and is quite a bit more robust in design than say an SLX. The Zee reminds me of the previous generation Saint but with the Shadow + tech behind it. 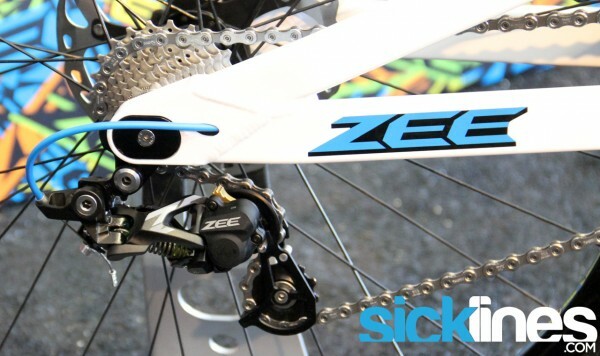 Like the new Saint, the Zee derailleur is 10 spd. I installed mine last week and I really like it, chain runs tight and quiet. Whats your first impression on it? Im torn between the Zee and the X9 Type 2. Seems like Shimano has a tighter hold with their clutch mech vs. SRAM's. I too just got a zee derailleur and shifter for my hardtail with a 1x10 setup, and it is really nice. I came off of a short cage x7 setup, and the zee is noticeably smoother. I opened up the cover over the shadow plus and found out that the whole clutch mechanism slides off 2 cams on the derailleur so you can adjust the tension screw off the bike. It works great!! I like to switch the lever to "off" when I'm climbing. I noticed there's some added resistance on the shifter lever when the derailleur is "on" but I can still get it to 36t ring no problem. Out of curiousity, are you running a front chainguide on the 1x10? Wondering how necessary it is with the clutch. Am thinking of going to this setup on my trail bike and wondering if I can just get away with just a Paul chain keeper or something super simple up front. and when you say "you can still get it to 36t ring no problem", do you mean the 36t cog or are you running a dual ring setup on your cranks? I'm running the freeride version 11-36t (I need to ride to some of the trailheads and I don't race). Before this I was running a 2011 X9 which was good when it was new, but was skipping and needed replacing. My initial thoughts on the zee are that it's tight and quiet as advertized. It looks solid and was a breeze to setup. In my opinion is doesn't come up short in any department and I can't warrent purchasing the saint derraileur over this.